After meeting a 14-member delegation of Bollywood celebrities in Delhi on January 10, the prime minister got photographed with a host of others on Saturday. Prime Minister Narendra Modi has been seen in the company of numerous Bollywood celebrities over the past few weeks. Filmmakers and actors have been posting photographic evidence on social media platforms of their encounters with Modi over the past few days. The prime minister, who is already in campaign mode for the upcoming general election, has also made it a point to tweet his thanks to the celebrities who shared the frame with him. The most recent lot of images came from the inauguration of the National Museum of Indian Cinema at the Films Division headquarters in Mumbai on Saturday. The museum traces the history of cinema through artefacts and specially created exhibits. 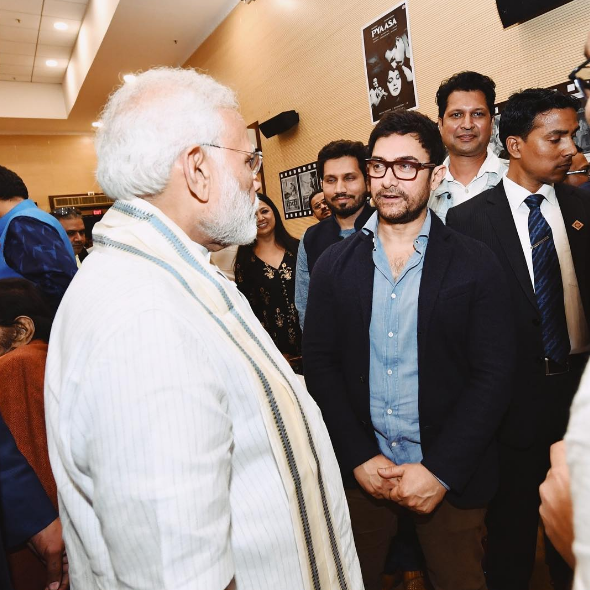 Among the stars who were clicked with Modi at the event were Asha Bhosle, Aamir Khan, Jeetendra, AR Rahman, Kapil Sharma, Rohit Shetty, Badshah, Parineeti Chopra, Bhushan Kumar, Divya Dutta and Kunal Kohli. Modi made an attempt at humour in his response to a tweet by actor Kartik Aaryan, who joked about not being to wangle a selfie with the Bharatiya Janata Party leader. Aditya Dhar’s film is based on the September 29, 2016, Indian Army operation on terrorist training camps in Pakistan-occupied-Kashmir. Uri: The Surgical Strike stars Vicky Kaushal as Major Vihaan Singh Shergill, who leads the operation. Paresh Rawal and Rajit Kapur plays characters modelled, respectively, on Ajit Doval and Narendra Modi. The line “How’s the josh?” is used by Vihaan to rally his soldiers. When PM @narendramodi asked this eminent gathering of Indian Film Industry- “How is the Josh”. Narendra Modi and Aamir Khan. Courtesy Twitter. Modi’s selfie-taking with Bollywood began a few weeks ago. On January 10, a 14-member delegation comprising directors and actors met Modi in Delhi. Filmmaker Karan Johar, leading the delegation, wrote on Instagram that the interaction was about how the Hindi film community could contribute to “nation building”. Accompanying Johar were actors Ranbir Kapoor, Alia Bhatt, Ranveer Singh, Varun Dhawan, Ayushmann Khurrana, Vicky Kaushal, Rajkummar Rao, Bhumi Pednekar and Sidharth Malhotra. Filmmakers Rohit Shetty and Ashwini Iyer and producer Ekta Kapoors and Mahaveer Jain were also a part of the selfie that had Modi at the centre. The meeting was organised by Johar and Mahaveer Jain, the producer of the National Film Award-winning Dekh Indian Circus (2011). “The next few months will bring a lot of good news for the industry,” Jain told The Times of India. The January event produced a lot more positive press than a previous meeting on December 18, 2018, to discuss, among other issues, General Sales Tax for the entertainment industries. The delegation that met Modi, which included Akshay Kumar, Ajay Devgn, Karan Johar, Rakesh Roshan, Ronnie Screwvala and Siddharth Roy Kapur, comprised only men, and got rapped for its non-inclusiveness. 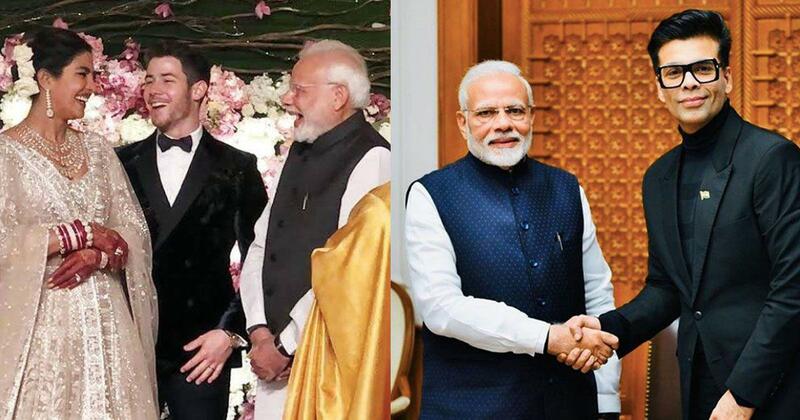 Before these meetings, Modi was seen at the wedding reception of Priyanka Chopra and Nick Jonas in Delhi. Modi’s attendance drew some jibes on Twitter, because in 2017, Chopra was criticised by right-wing trolls for apparently disrespecting Modi by sitting cross-legged and wearing a skirt of seemingly inappropriate length.